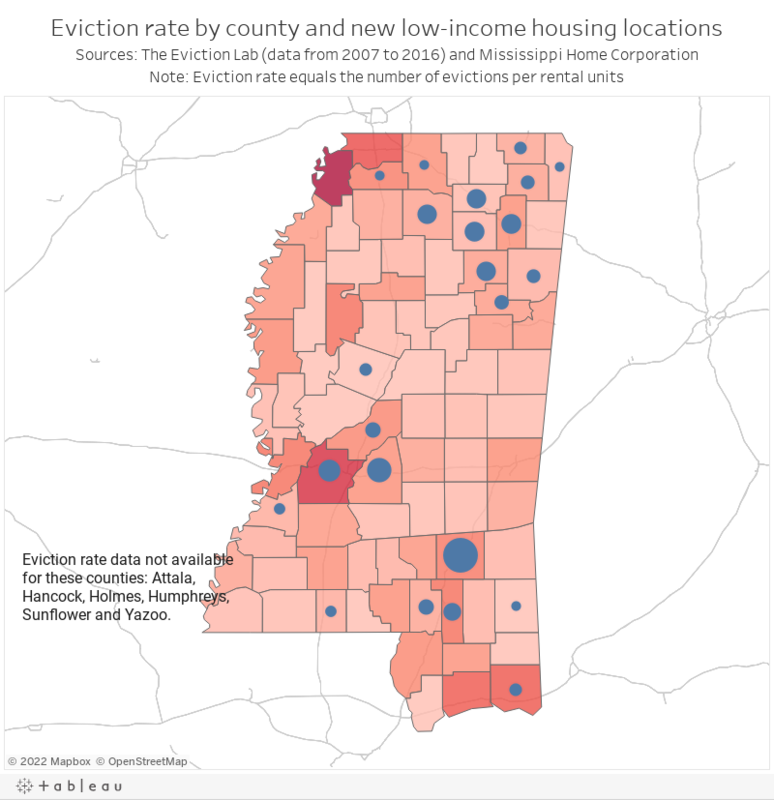 JACKSON, MS (WLBT) - Sobering statistics from researchers at Princeton University show an eviction epidemic in parts of Mississippi, with Jackson ranking fifth in the nation. A months-long 3 On Your Side joint investigation with Mississippi Today reveals a low-income housing system that disproportionately affects many of its tenants and suggests America’s bipartisan affordable housing efforts -- funded by federal tax dollars -- may be trapping even more within its walls due to a lack of accountability and regulation. Some who have yet to fall into that eviction cycle find themselves instead faced with health issues from a lack of code enforcement in their homes, like Tamika Calhoun. From the moment Calhoun moved into The Village Apartments on Raymond Road, she hoped it would be a temporary solution for her family. Now, thirteen years later, health concerns keep her stressed. “My ceiling, it started to get really soft like it was gonna come in, until they fixed the AC. The AC was broken for about two and a half weeks," Calhoun said. Leaks in her apartment’s air conditioning unit caused floor and wall damage, she said. Calhoun thought mold had infiltrated her walls, a terrifying prospect for this mother of five. They never did test that wall, so we agreed to help her do that before workers came to address the problem. While Calhoun waited for the results, maintenance workers used bleach to clean the wall. Jackson 311 records obtained by 3 On Your Side show two possible code violations at The Village Apartments in the last eighteen months, though city officials never confirmed these through follow-up visits. Seven months later, another tenant expressed concern about breaker box malfunctions, holes in the kitchen floor and water leaks in the ceiling. The unidentified caller said a maintenance employee for the apartment complex told her to move to another unit, but the lack of available units meant she would have to be on a waiting list. Many of the problems described in those documents echo Calhoun’s own experiences. “[Mississippi Home Corporation] visually verifies that the work is done, so it’s preposterous for a tenant to claim that the work was purely cosmetic." The Village Apartments is one of nearly 50 complexes still functioning as low-income housing tax-credit properties in Jackson, according to a Mississippi Today analysis of public records. In 2007, the developer for that complex -- Perseus Housing Associates, LP -- got $2.2 million in federal tax credits to rehabilitate the property. 3 On Your Side reached out to the state agency that awarded Perseus those tax credits -- the Mississippi Home Corporation - -to see if the money the developer received a decade ago had been used to repair the property. “MHC visually verifies that the work is done, so it’s preposterous for a tenant to claim that the work was purely cosmetic,” MHC executive director Scott Spivey said in an emailed statement. Spivey said The Village Apartments passed a physical inspection by MHC on September 5, and work on the floors should be done by the end of the year. Calhoun maintains management -- St. Louis-based McCormack Baron -- uses intimidation to make sure other tenants don’t come forward about their apartment issues. “They’re not really protecting themselves by trying to evict people who speak out about it,” Calhoun said. Connie Raney, a spokesperson for McCormack Baron, couldn’t comment on practices at that particular complex, but did respond to Calhoun’s concerns. “It’s unfortunate that any one of our residents would feel that way, and we would encourage them to contact our St. Louis office with any issues,” Raney said. 3 On Your Side looked through hundreds of pages of eviction filings in Hinds County. Those documents show management at The Village Apartments filed for eviction 507 times over more than two decades. Could this trend be found in other places? 3 On Your Side teamed up with Mississippi Today to look through thousands of eviction filings collected by Princeton University’s Eviction Lab. Our analysis focused on two counties with some of the highest eviction rates in Mississippi: Hinds and DeSoto. Because nearly half of Hinds County rents, it might not be surprising that Hinds had an eviction rate of 8 percent in 2016, the second highest in the state. However, DeSoto County’s eviction rate wasn’t far behind: 7.93 percent that same year, which seems unusual because that county’s poverty rate is three times lower than Hinds. To find the eviction rates for specific apartment complexes, both news organizations had to look through thousands of court filings in the two counties, which proved to be easy in DeSoto because those were available online. Tracking eviction filings in Hinds County turned out to be far more difficult because of the computer system used by the justice court staff. The analysis revealed certain complexes with high eviction rates in DeSoto. One of the top five on that list -- Southaven Partners -- evicted under multiple names for its complexes: Terrace Park, Bradford Park, and Hampton Park. The collection of buildings off Airways Boulevard in Southaven has since been renamed collectively “The Terraces," with a combined 12 percent eviction rate over more than twelve years. By comparison, Eviction Lab notes the national eviction rate average at a little over 2 percent. Over the course of this investigation, we learned one possible reason these eviction rates appear to be high is because of how the word itself is defined: an “eviction” doesn’t always mean the person has been removed from the property. Mississippi Today tracked thousands of instances where property managers filed multiple eviction judgments against the same tenant at the same apartment complex. That research on serial evictions brought our investigation to the DeSoto County Justice Court in August, when LaQuisha Smith appeared before a judge because of a nonpayment eviction filing. Management at Hampton Park in Southaven filed evictions against Smith 9 times in a little more than two years. “Why would you constantly drag me to court when you could just be like, okay, just get out? You’re not paying on time, you can’t afford to pay on time, so you just can’t afford to be here," Smith said. 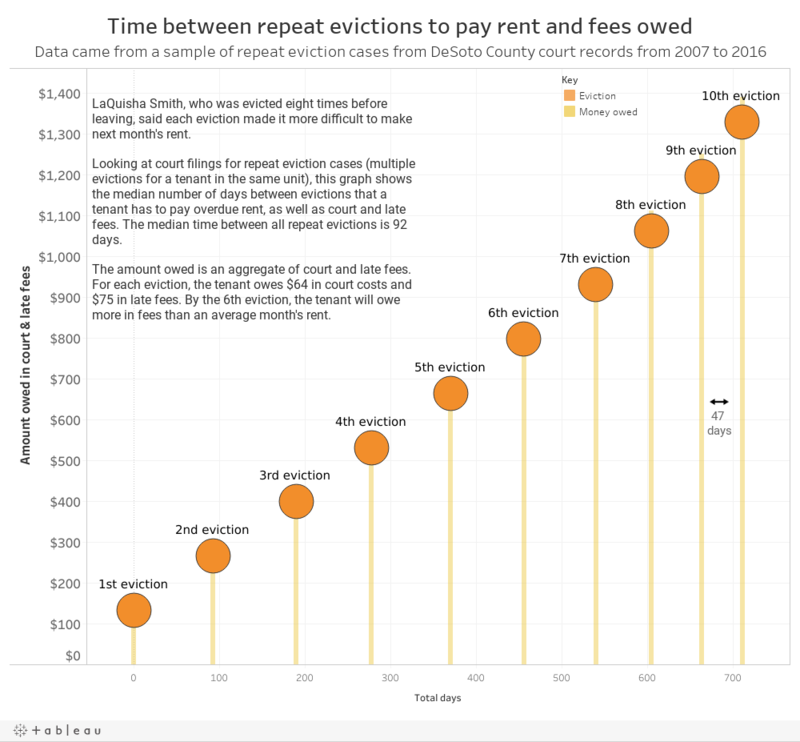 Of the nearly 4,600 filings in DeSoto County at low-income properties over the last decade, nearly half were serial evictions. “I have had multiple breakdowns because of the whole situation. It’s very stressful, me being a single parent and trying to make it," Smith said. 3 On Your Side reached out to Smith’s property manager to ask about these serial eviction rates, but they refused to comment on the record. Policies issued by Valdosta, Ga.-based Ambling Management -- show how the management company encourages its employees to file evictions like clockwork, even budgeting money just to pay for the court filings. Simply put, companies like Ambling use the justice court system as a collection agency when tenants don’t pay their rent. What ends up happening to tenants like Smith is a revolving door of debt that’s hard to escape. “My lights have gotten cut off and everything in order to pay my rent," Smith said. Nearly every time the eviction process has gone to court, Smith found a way to pay her rent. By that point, though, the month was nearly over. Suddenly, next month’s rent is due, and the cycle continues, much like when someone gets behind on a credit card payment. The eviction process itself ensures that Smith and others have few options to break the cycle of low-income living, because apartment managers check a potential tenant’s record. “You cannot have any evictions on your background, or you know, your credit has to be a certain score. I said I wanted to get into me a house by next year, but I know it’s going to be a struggle," Smith said. Smith’s ninth eviction proved to be the end of her stay at The Terraces, after she claimed management tried to charge her for two months' rent. However, property managers have no right to charge for two months of rent under Mississippi law. That judgment can only be issued by a justice court judge -- after eviction court. Our investigation found that the system designed to help people through temporary government assistance leads to financial issues that keep tenants like Smith in the system or worse, homeless. From an accountability standpoint, the Internal Revenue Service provides around $7 million in federal tax credits to Mississippi every year, but doesn’t actually inspect or monitor where the money goes. Instead, the IRS relies on the Mississippi Home Corporation to do that. MHC watches these properties for fifteen years after issuing those tax credits to developers, inspects twenty percent of the property’s units every three years, and requires developers to monitor themselves. After three months of compiling and analyzing eviction filings, 3 On Your Side reached out the agency’s executive director to share our findings. Spivey declined an on-camera interview -- twice -- but did allow us to ask him questions without a camera present. Spivey said MHC’s scope has expanded in the last three decades -- they’ve implemented more programs to help tenants -- but he doesn’t believe the eviction issues uncovered in our investigation are MHC’s responsibility. “I think that property managers and the landlords are ultimately accountable for the eviction issue," Spivey said. “That makes me feel like this whole interview is pretty much pointless because no one’s gonna take responsibility. Everyone’s gonna point the finger and nothing’s gonna be done about it." While MHC is ultimately accountable to the Legislature (and by extension, taxpayers), it appears few regulatory measures have been taken against the agency since its inception nearly three decades ago. Since 1994, Mississippi’s Joint Legislative Committee on Performance Evaluation and Expenditure Review (PEER) has investigated MHC at least five times, including performance audits, follow-up reports and compliance reviews. Most recently, the watchdog group studied two years' worth of data to determine whether MHC was fulfilling its mission and being good stewards of the federal tax credits that flow through its building. Though MHC’s operating expenses aren’t funded through the state’s coffers, the entity’s very creation through statute makes it a public body. And, according to state law, MHC’s financial transactions and records are subject to at least an annual audit by the state auditor. A cursory search of the state auditor’s website revealed no MHC audit reports listed. Agency spokesperson Logan Reeves said he couldn’t conclusively say that the corporation had never been audited without investigating further. “It’s been at least fifteen years since we would have conducted that audit,” Reeves said. PEER appears to be the only organization that has done that. The organization’s own mission statement -- taken from a PEER report which also criticized some of MHC’s practices -- said the agency aims to finance safe, decent, affordable housing and help working families build wealth. However, the higher rates of evictions, particularly serial evictions, documented through our joint investigation seem to contradict MHC’s purpose. Spivey disagrees with that characterization. That doesn’t sit well with Calhoun. “That makes me feel like this whole interview is pretty much pointless because no one’s gonna take responsibility. Everyone’s gonna point the finger and nothing’s gonna be done about it," Calhoun said. The water damage in her apartment serves as an example of what she’s talking about. Management never tested her wall, so we helped her do it. The results confirmed what she feared: five different types of mold. Two of those types could affect people with weakened immune systems, like children. “I was hoping it would come back that everything was harmless, because like I said, we’re living there," Calhoun said. Our investigation found that, unfortunately for Calhoun, her options are somewhat limited. In many cities and counties, code enforcement officers only regulate the outside of the home, not problems inside. Jackson stands as one of the few that does address interior issues. Calhoun’s issues also clearly seem to be health code violations, but the Mississippi Department of Health told 3 On Your Side it’s not the agency’s responsibility to deal with tenant issues, instead referring them to their property managers. Spivey said tenants can file a complaint with MHC if it’s serious enough and the agency’s employees can perform a spot inspection on the property, sometimes within days of a tenant’s call. Until then, Calhoun has to rely on her landlord. “My kids are there and that’s the most important thing to me, their safety. I was blessed to have five healthy babies, and they’re still healthy. Don’t do anything to jeopardize that," Calhoun said.